Domo made a big splash a few weeks ago. You might call it a double splash; like two consecutive, offensive linemen doing cannon balls into your backyard pool. First, they announced $131 million in additional venture funding, bringing the total raised to over $600 million. The stated use of these proceeds? Two words: “Alec Baldwin.” That’s not entirely true, but certainly sales and marketing will be a significant use of proceeds. It is likely that a decent portion of the round provided liquidity for earlier shareholders. The second splash was that Josh James, the CEO, announced a plan to make Domo a platform beyond business intelligence applications. Domo wants to be a “business cloud”—which means it is now competing with SalesForce, Netsuite, Oracle, and Amazon; in addition to its previous competitors, Tableau, Microsoft, Gooddata, and Jaspersoft. All of this got me thinking about the big challenges that I have been grappling with in respect to 3rd party cloud-based business intelligence solutions. The concept is awesome! In fact, I had a Domo salesperson in my office when I was the CFO of Goal Zero in 2013. We were a business that finished 9th on the Inc. 500 that year, so we were growing fast. I was interested in what Domo had to sell because I had experienced the benefits of business intelligence at my previous company, OrangeSoda. Domo was, and still is, a local darling here in Utah, and our companies shared a key board member. I really wanted to pull the trigger on a purchase. To make it even more tempting, the salesperson who showed up was a friend from elementary school. How could I say “no”? I struggled then, and I continue to struggle now, with the grim reality of implementing a great business intelligence system. I had an incredible business intelligence system at OrangeSoda. It made managing the business and key performance indicators SOOO much better. It was also supported by individuals who knew our business really well. They were able to adapt to everything we learned as we started banging on the system. Their system gathered data not only from cloud-based services, but also from our local databases. The most significant part that made it great was how custom it was to our business. I’m sure one-size fits-all business intelligence can make a ton of sense for many companies, but I loved the custom fit we had at OrangeSoda. It was like the perfect fit of a well-tailored suit. With a 3rd party cloud-based business intelligence solution, we would have had to adapt their system and use their pre-structured platform. To an extent, this would have meant giving up control of our data because most 3rd party cloud-based business intelligence solution platforms only support the software they offer. We would’ve been prevented from adopting best-of-breed visualization tools, like Tableau and PowerBI, as they came out, and working with the many other emerging solutions in other clouds. So, that day in 2013 with my old friend—as I probed to see how their platform could hopefully accomplish at Goal Zero what my custom system had done at OrangeSoda—I found myself unable to move forward. I believe Domo has some raving fans, and I wish them a ton of success. We’d love to have some of our financial software plugged into their platform and made accessible to their 1,000+ customers, but, to state the obvious, not all software makes sense for all situations. Each company needs to determine what makes the best sense for their specific set of circumstances. How much control of your data and platform do you need? A fully cloud-based, per-month solution offers the flexibility of renting, but all of the dashboards and widgets go away into the cloud, if you don’t pay your rent. Sure this would happen too, if you had your data in Amazon or Azure clouds, but you’d have the option to buy the same on premise solutions and just move down from the cloud without losing what you’ve spent months/years building. A custom system is yours for the keeping, but updates may not be pushed out the way a cloud system would. Like owning a home, if something is broken, then you’ll have to pay to get that fixed. It’s one of the joys of ownership. It may be yours for the keeping, but you don’t call the landlord when it’s broken … you pay for the handyman yourself. On premise solutions still make sense for certain companies. Many ERP systems with some of your best data are on premise. Cloud-based systems have ways of getting that data into the cloud, but you may want to consider a non-cloud or partial-cloud custom business intelligence solution. One slight difference in the build versus buy comparison is that when renting a place, you expect it to be move-in ready. 3rd party Cloud-based systems (like Salesforce in the CRM world) still require significant implementation costs. How open to emerging technologies are you? Domo, as an example, is a cloud platform built in Amazon. They use Amazon RDS and Redshift for the databases, and have rebranded Pentaho Kettle as Magic ETL. You need to determine if you would be better off just using Amazon and building your own. Some 3rd party cloud-based business intelligence solutions are doing a fair amount of experimenting. As with any emerging technology, that comes with some risk and you’ll have to assess your tolerance for the risk/reward of that experimentation. Do you have any special security needs? Is your IT team okay moving your data outside your company’s network? If not, Azure offers a hybrid cloud (see previous post), which is great for extending your existing company network. What are your ad hoc reporting needs? One consideration is that if you like the 3rd party visualizations like those provided by Domo, one option is to do the data modeling in your own database, and then feed the data to their platform for only the visualizations. This way you would get all of the benefit of their visualizations and social communication tools, without giving up control of your data. This could be a more expensive route, but if you ever want to implement another business intelligence tool, you wouldn’t be back to square one. Our company currently works with a local team of business intelligence experts called Xerva. With a custom business intelligence solution, like the one we use now, we work closely together on creating the KPI reports we know we want. From there we can create ad hoc reports as easily as playing with a pivot table in Excel or building a dashboard in Power BI. This was key for me when we were selling OrangeSoda and the buyer wanted to see our data six ways from Sunday. With our custom system I could slice it and dice it however they wanted. Starting with your own Amazon or Azure database allows you to begin at almost no cost and scale up with performance and database size, as your company grows. With fixed cost platforms, you may lose a lot of the savings benefit of moving to the cloud. You could end up paying for more than what you need for storage and performance when you’re small. Who do you want to work with? Who is helping you with implementation of the system and what’s their business background? How much experience does the person doing your implementation have with BI? Not the company, but the actual person. In the end, someone is doing the work. There is no magic business intelligence wand. Whoever they are, they need to know your company and business intelligence inside and out. Who will be helping you on an ongoing basis? How much can your own team easily maintain? Make sure you aren’t buying a cannon to take out an ant hill. 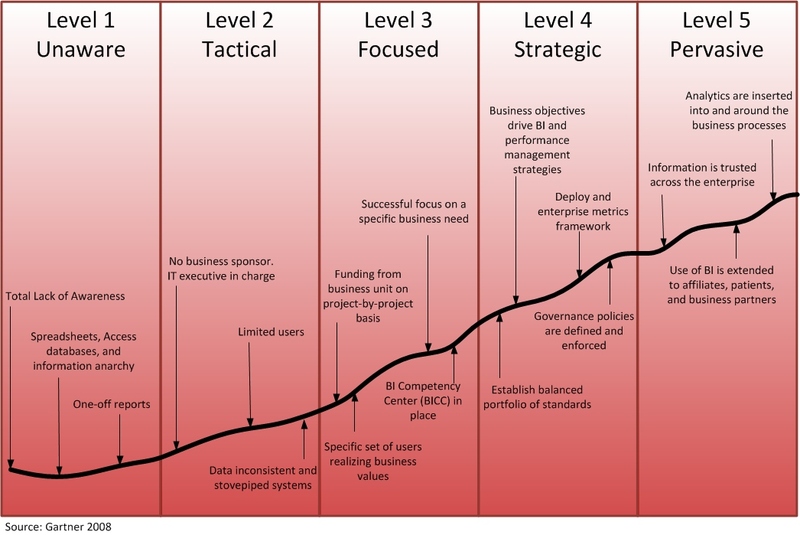 Understand where you are in the business intelligence maturity model (see a helpful link below.) As my mom used to say, “don’t let your eyes get too big for your stomach” – the same logic applies here. Microsoft offers a platform where you pay for what you need. Your company might even have the talent on staff to start implementation yourselves. If some help is needed, you can always call a lifeline. We’re currently partnered with Xerva and for us it’s the right solution. Some people turn to a BI-as-a-service solution because they are frustrated that IT isn’t getting them the dashboards they want from other departments: Marketing, Sales, and Finance/Accounting systems. However, IT may not be providing this due to capacity constraints within those departments. Make sure you’re not just pushing the bottleneck from inside your company to outside your company at a high cost – first figure out the bottleneck. Then, IT may be able to get you the dashboards you want with much less expensive tools. Make sure you are not paying for software that you could get for free. There is a great, free download called “Kettle” from Pentaho. How does the software rate in the industry? Hopefully, the above questions/key points are helpful in determining whether BI-as-a-Service is for you, can you resolve your business intelligence needs yourself or do you need a custom business intelligence system implemented with assistance from an outside source. Feel free to reach out, if you have any questions.